Tottenham Hotspur are reportedly preparing a £35m bid to acquire the signature of Declan Rice from West Ham United in the summer. 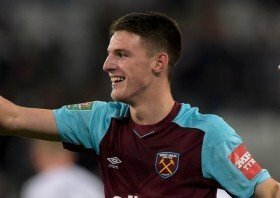 The 20-year-old's future was hanging in the balance earlier in the campaign before he penned a long-term deal with the Hammers which will run until the summer of 2024. This has, however, not ended the speculation regarding his future and according to The Express, Spurs could test the Hammers' resolve with a £35m bid in the summer. Rice, who was previously in the youth ranks of Chelsea, has been in outstanding form for the Hammers in the centre of the park despite their mixed league run through the campaign. Spurs are likely to pursue a replacement for Mousa Dembele when the season closes after they failed to spend a single penny over the course of the past two transfer windows. Dembele was initially touted to see out the remainder of his contract until the summer but Spurs decided to cash in on his services prior to that with Guangzhou.